Sometimes I'm just amazed at how the simplest food preparation can produce such wonderful results. I wanted to use up some potatoes that were getting kind of old, and I was thinking of all the different ways I could prepare them when I settled on peeling, cutting into large hunks and pressure-cooking for five minutes. 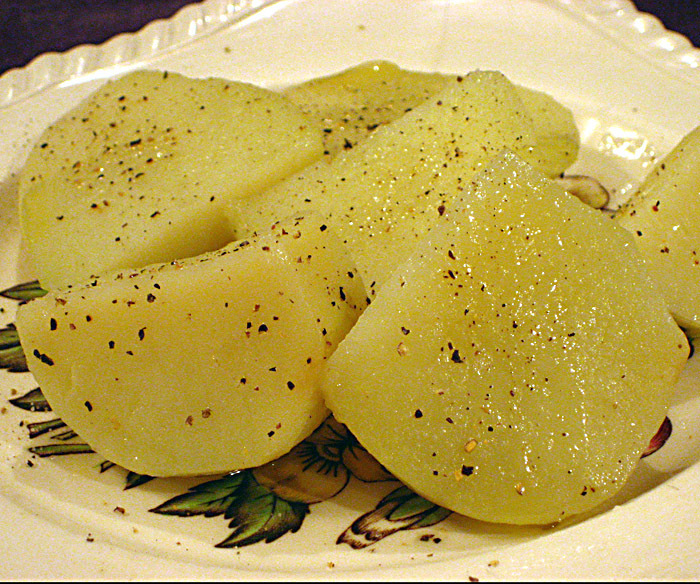 The resulting potato chunks were put on a plate, sprinkled sparingly with salt, dusted with freshly ground pepper and drizzled with a bit of olive oil. Perfection. The pressure-cooker really is a time saver, a flavor enhancer and an invaluable aid to lazy cooks. I will start using it more to cook vegetables and beans. In the case of the potatoes, I put about one inch of water into the cooker with the potato chunks, brought it to pressure, turned the heat down a little and set the timer for five minutes. When the timer went off, I turned off the flame and let the pressure come down. The result was full-flavored, perfectly cooked potatoes. Pressure cookers sound really convenient, but I'm intimidated by them. Is it complicated? Are you worried about food exploding on you? Modern pressure cookers are very convenient, and, I think, safe if you follow the directions. I've never had a problem with mine — no explosions!